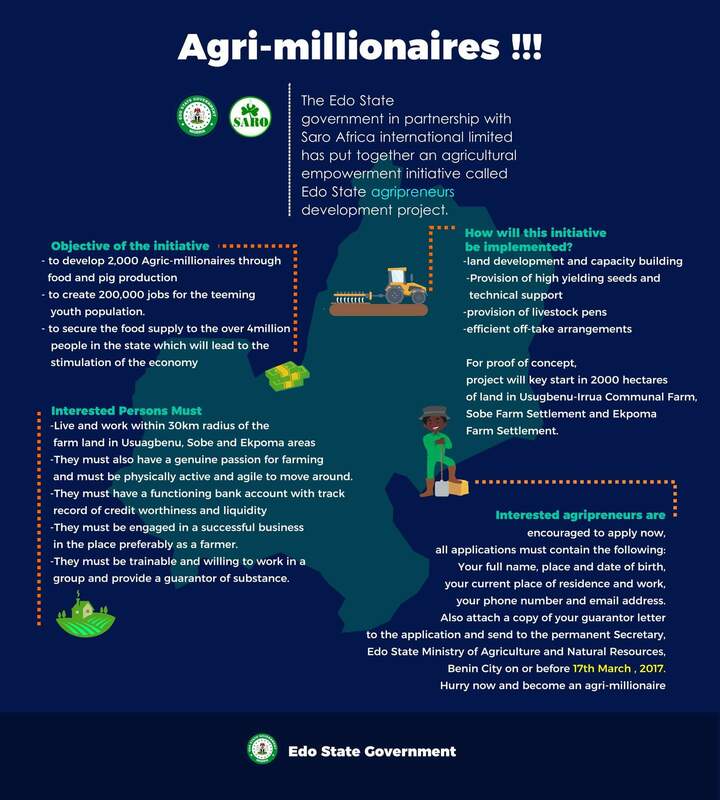 The Edo State Government has fixed Wednesday, 5th of April this year for the official opening ceremony of its agricultural empowerment initiative code-named ‘Edo State Agripreneurs Development Project’ in Sobe, Owan West Local Government Area. The state government had invited interested individuals who wished to become agripreneurs to apply to the Permanent Secretary, Ministry of Agriculture where they would be screened and signed-off for the pilot scheme, which, according to Governor Godwin Obaseki, is ‘revolutionary’. The initiative, which has the potential to provide jobs and food for not only the state, but also the entire South-South region, could develop 2,000 agripreneurs through food and pig production, as well as create 200,000 jobs, which will lead to the stimulation of the economy. Chief Press Secretary to the governor, Mr. John Mayaki, explained how the initiative would be implemented, adding that the government would develop economical, environmentally feasible and sustainable agricultural projects within the state. “There would be focus on land development and capacity building, while the government would provide high-yielding seeds and technical support”, he said. In addition, the government would provide livestock pens and efficient off-take arrangements, which will significantly reduce the burden of cost on the part of the potential agripreneurs. The project will kick off with maize production on 1000 Hectares of Land in Sobe Farm Settlement while Usugbenu-Irrua Communal Farm and Ekpoma Farm Settlements are scheduled to come next. Outlining criteria for eligibility, Mr Mayaki noted that interested people must live and work within a 30-kilometre radius of the farmlands in Usugbenu, Sobe and Ekpoma areas and they must also have a genuine passion for farming while being physically active and agile to move around. Moreover, the interested individuals should have a functioning bank account with a proper record of creditworthiness and liquidity even as they must be engaged in a successful business in the place, preferably as a farmer. Encouraging potential agripreneurs to apply immediately, they must also be trainable, willing to work in a group and provide a guarantor of substance. Applications must contain the participant’s full name, place, and date of birth, current place of residence and work, phone number and email address. Also required are an attached letter from a guarantor to the application.